In the steep bank of Merri Creek in Westgarth is a tunnel that brings to mind the opening sequence of Raiders of the Lost Ark. Dug over the past four years, this passage runs deep underneath the suburb. It is pitch black, rocky and eerily quiet. But if the tunnelling continues, a find worthy of Raiders may emerge - a World War II bunker bearing wooden crates marked "US Army". The Indiana Jones in this real life story is a Mount Evelyn man called Mark Rawson. Just like Indy, Rawson has a mild-mannered weekday job - he is a solicitor. But on weekends he dons... well, not a leather jacket, fedora and bull whip, but a safety vest, hard hat and shovel. Mr Rawson, 49, and a handful of colleagues are convinced that an extensive bunker system dating from the 1940s lies underneath inner Melbourne, which may contain US Army weapons, chemicals or explosives. They said they are not digging a new tunnel, but through an existing tunnel from the 1940s that was filled in and sealed by the departing US troops. Mr Rawson attracted minor publicity several years ago when his team first began digging. Now, 120 metres later, he believes the bunkers could finally be within reach. The second seal we've been digging through isn't there to stop us getting in, it's to stop whatever's on the inside getting out. We're not digging through natural ground. We're digging through something that the Americans put back in," he told The Age. "What the hell have they sealed in there? The US Army had extensive facilities in Melbourne during the war and for a time hosted the headquarters of General Douglas MacArthur. The US Army camp at Royal Park, Camp Pell, is well known, but the full extent of American infrastructure - including underground tunnels designed to resist possible invasion - remains secret. Mr Rawson, an amateur archaeologist and historian, was tipped off to the Northcote tunnel by former residents Neil Speed and Alan Maple, who saw the entrance in the 1940s, guarded by a plainclothes US Army officer. Mr Maple, a child at the time, said he went down the tunnel and saw crates marked "US Army High Explosives". Mr Speed showed Mr Rawson where the original tunnel entrance, long since removed, once was. The team started digging and, sure enough, there was a seal of bricks. Now the team are digging through a second seal of bluestone, clay and lime. Darebin council engineer Graeme Houlden said the council had chipped in about $30,000 to provide supporting works, including a steel gate at the entrance. Mr Rawson believes the bunker system could link Northcote, Royal Park, Richmond, South Yarra (the US Army was at Melbourne High), Fairfield and Dights Falls (where the war cabinet would apparently be whisked by boat up the Yarra in case of attack). There are other rumoured military installations, he says, at Mt Evelyn and on the top of Mt Dandenong. There is a similar team, North Queensland Research and Salvage, doing similar digs in Townsville. "(There are) a realm of possibilities," Mr Rawson said. But very few proven facts? "Almost none," he admitted. What is real is his commitment, and that of his colleagues, who include a truck driver, ex-mining engineer and a fireman. The Age dropped in uninvited on a sunny weekend. The team were stuck 15 metres underneath Westgarth, drilling rocks. Mr Rawson said at least a couple of weekends a month were spent on site. About six people worked at a time. "I think the public in general would really like to know what they've been sitting on for the past 70 years, what our glorious allies have left under us," he says. There are no maps or archival records that pinpoint where the tunnel goes. But Mr Rawson did drill 50 metres directly down at a point in Green Street, about half a kilometre away, and found pieces of wood supposedly from the tunnel structure. The team are in touch with the army and police, and will alert them should something toxic be found. Their contact at Victoria Police, Whittlesea/Darebin divisional superintendent Geoff O'Loughlin, said he was doubtful they would, but praised Mr Rawson's "great integrity". 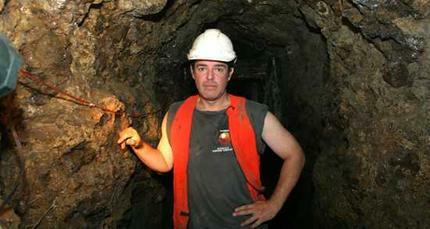 Urban historian Graeme Davison, from Monash University, was dubious the team would find a tunnel network or an arms cache within them. "I wouldn't discount it entirely, but I'd be really looking for some confirmatory archival evidence," he said. Darwin was bombed in the war and there were Japanese submarines in Sydney harbour. But the threat to Melbourne was brief, he said. Why build an intricate network of bunkers? "An underlying assumption is that there was immediate danger of attack and capture by the Japanese. I'm not sure that was ever the case. Australia was bombed in the north, but Melbourne's a long way from that. The danger of immediate attack receded pretty quickly. It's a very significant undertaking to place such cache of arms for what was a very temporary emergency. It seems there's a lot of conjecture but not a lot of hard fact." Mr Rawson remains a believer. "We're about to open a Pandora's box," he said. "The interesting side of the coin is what happens when we do."